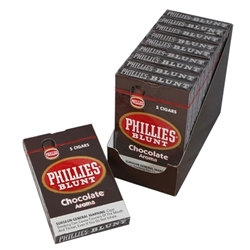 Phillies Chocolate Aroma Blunts are delicious, chocolate flavored cigars measuring 4 7/8 inches in length, with a ring gauge of 41, making them smaller than coronas but larger than cigarillos. These cigars have gained in popularity amongst both occasional and regular smokers for their great chocolate flavor, wonderful aroma, and affordable prices. Their mild and consistent burn enhances the taste and provides a pleasant smoking experience. Try a Phillies cigar today here at Smokers Discounts!